Shamefully, I have to admit that this was my first attempt ever at cooking collard greens. I was always curious but just didn’t think that cooked greens could actually taste good. I don’t think I could have been more wrong. Not only was this Bacon Collard Greens Recipe to die for delicious, it has become one of my absolute most favorite Weight Watchers Recipes. My husband and I gobbled this dish down like it was a hot fudge brownie sundae. Yes, it was that good. We completely forgot about the main dish recipe that night and just tore up these Bacon Collard Greens like there was no tomorrow. If you are looking for a fantastic vegetable recipe that will help you get your greens in, what better way is there to eat them than cooking them with bacon!?? Seriously…go get the ingredients, and make this ASAP. And at just 2 Points per serving, it’s the perfect low calorie side dish recipe to compliment your favorite Southern meal! 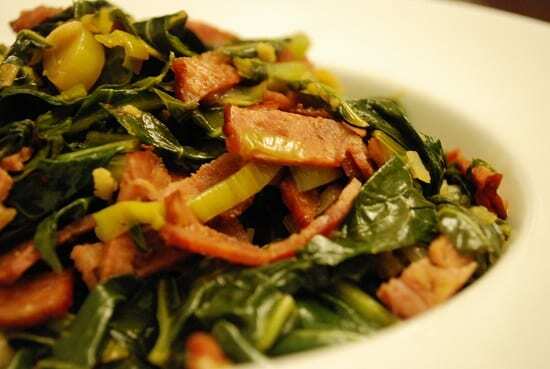 Amazingly full of flavor, this low Points side dish of Bacon Collard Greens will certainly satisfy your Southern appetite without sacrificing your waistline. Each serving is just 2 Points and it tastes wonderful! Spray a large nonstick pot or skillet with nonfat cooking spray and set over medium-high heat. Add bacon, and cook until crisp. Remove bacon from pan and set aside to cool. Re-spray the pan with a bit of the nonfat cooking spray and then add in the onion, and cook until tender, about 5 minutes. Chop or crumble the cooled bacon and add it into the pot. It’s funny I should stumble upon this recipe while Googling for some dinner ideas; I’ve been fixing a variant of this on my own for ages now & have always loved it. My recipe is a lot less structured than this – I just do two slices of turkey bacon per serving that I’m cooking (for example, if I want enough for tonight + leftovers for lunch tomorrow = four slices), two big fistfuls of chopped collards per serving, maybe a clove or two of garlic, some black pepper, and lots of ground coriander (the sweet with the savory is incredible). Chop the raw bacon into bite size pieces, cook it in a big pot (no need for non-stick spray), pour in 1 cup of water with the bacon once it’s crispy, dump in the greens & spices, give it all a quick toss, put a lid on it to steam, drain and serve. The whole thing can be tossed together in five minutes if you buy the pre-chopped (but not frozen) collards, cook time is maybe 10 minutes total. I made this two nights in a row – my family loved it!